I don't consider myself a big fan of the Thriller genre. The premise really has to have something special for me to give it a go, and The Passenger definitely sounded like it would be intriguing! 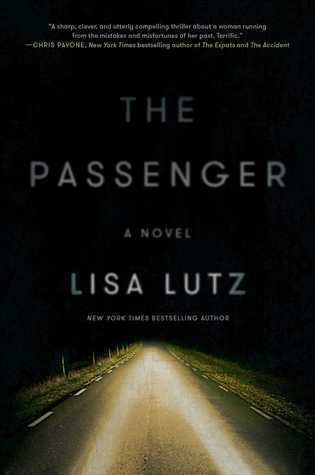 The Passenger was one amazing reading experience! It was mysterious and so thrilling! I was literally sitting on the edge of my seat almost the entire time. The Passenger wastes no time, it explodes right off the bat with Tanya finding her husband's body and the suspense doesn't stop until you turn the very last page. There were some very minor details of this book that got a little lost; a few plot holes here and there, but that will not take away from the overall experience of this novel. Lisa Lutz crafts a heart-pounding story and takes you on a ride through a woman's life, through the before and after. The story is delivered from Tanya's(and her aliases) point of view and it is done extremely well! This is my first novel by Lisa Lutz, although I have heard of her! Almost every bookworm I chat with will always recommend The Spellman's series, a series that I will now have to indulge in! I found The Passenger to be a quick, heart-pounding read with a unique storyline. One that will keep you reading until the very last page. You'll simply be dying to know how it ends! Lutz does a brilliant job making you care about her protagonist. The writing is masterful, sharp and smart. The scenes are well-crafted and carefully plotted while keeping the quick pace, which encourages a sense of urgency while reading. The ending is very satisfying and worth the nail-biting that happened along the way. This is a perfect stuck-overnight-at-the-airport book. You'll be hugging your handbag closely and trying to keep tabs on your fellow travelers while racing to the end of this worthy thriller.